On Sunday work – and a natural curiosity – took me back to East London for Judy’s Affordable Vintage Fair. Ever since I moved away from the area I’ve been drawn back on many a weekend to explore the place I used to call home. 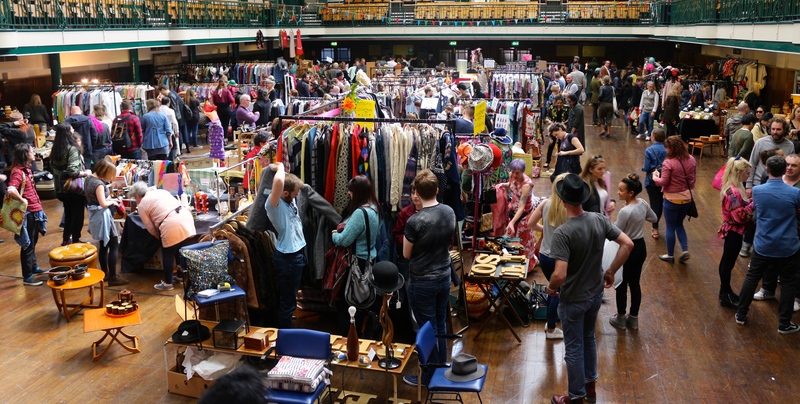 For the princely sum of £2, (or £3 for early birds who can enter the fair 30minutes before the masses descend), you can access a huge selection of vintage clothes spanning every decade from around the 1940s to the 1980s. The atmosphere was electric with eager shoppers rifling the rails in search of the perfect vintage item to add to their collections. In terms of what was on offer I saw a great mix of men’s and women’s fashions, jewellery and even homeware items. I absolutely loved spending a morning at Judy’s. There were items to suit every budget with lots of sale rails – I spied one ladies clothes rail with items starting at £2 – bargain! I’ve always been interested in homeware items with a bit of history but never known quite where to start when it comes to vintage clothing. I appreciate it but I’ve always been at a bit of a loss as to what styles might suit me. I’ve given it a go in Brick Lane before and I really wasn’t impressed with the items on offer. Vintage clothes were mixed in with tatty regular second hand items and prices were exorbitant. For me, Judy’s was the perfect introduction to vintage shopping. The sellers were all really knowledgable and were able to make recommendations and give hints and tips on how to dress according to a specific era. If you’re looking for something a bit different or fancy dipping your toe into the wonderful world of vintage fashion and furniture keep an eye out for Judy’s Affordable Vintage Fairs, which take place all over Great Britain. They run a mix of events from their standard vintage fairs to an event called the Kilo Sale whereby you fill a bag with whatever you fancy taking home and pay £15 per kilo. They also run The Vintage Furniture Flea if you’re more interested in fashion for the home. I took a few snaps on the day to give you an idea of the variety of items available for purchase. I thought it was a real treasure trove! I hope you enjoy taking a peek at some of the items that caught my eye.